While you’re visiting Seminyak, one of the things you can’t miss is spending the day at a pool or beach club. Why? 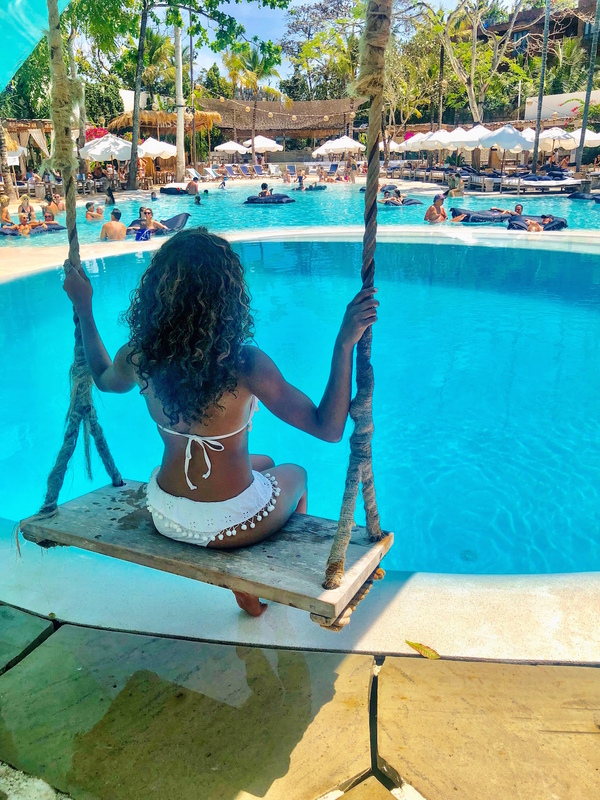 It’s the bulk of the entertainment in town during the day, an unforgettable way to see the sunset (at most of the clubs), and it costs way less than a cabana at a pool party in Vegas or a glitzy international destination like Mykonos, Greece. Although Seminyak is known as a party town, the beach clubs there are surprisingly laid back and family friendly. No one is dancing on tables or partying on their daybeds. 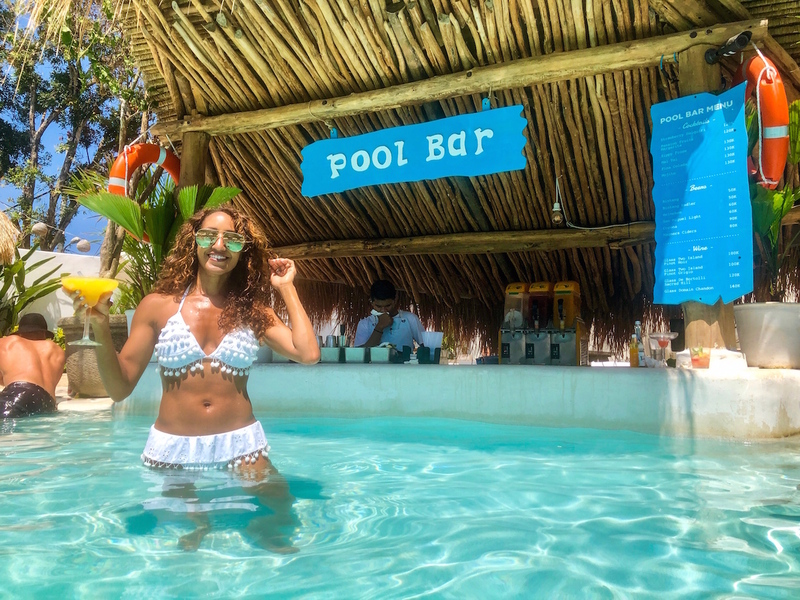 Instead, clubgoers kick back on daybeds by the pool, hang out in the pool, lounge on the beach, indulge in amazing food, sip killer cocktails, and relax. There were kids at every beach and pool club that we visited as well. What to Wear: Keep it casual. Rock your bathing suit under a coverup, or with a top and shorts, or sarong. Wear flat sandals or slides (keep in mind that you can actually go down to the beach at the beach clubs), and tuck a pair of swim shoes in your beach bag just in case you need them. The thing about that diving board is it looks like an easy feat as swimmers skip up the stairs and flip their way off of it. But, when we got to the top, it was a whole different experience. “My heart is beating so fast!,” a woman in front of us said. Our hearts fluttered too as we looked down at the massive drop…and then we jumped…to the longest free fall we’ve ever experienced. Without thinking twice though, we did it again. Whether you jump once or twice (or four times), It’s a must try if you’re a bit of a daredevil. 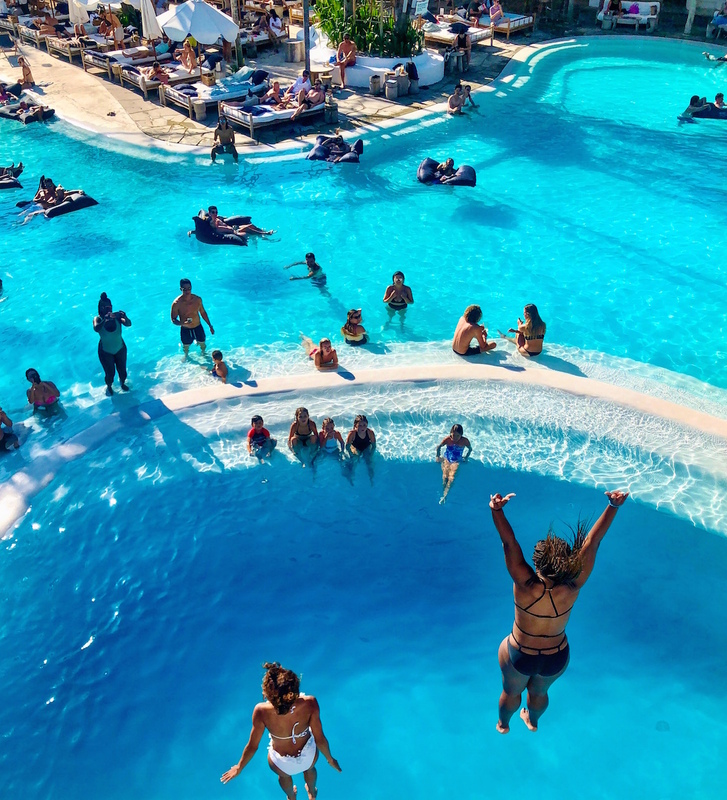 If you’re not, you can always jump off one of the lower boards, or enjoy the tricks and flips of other while you’re soaking up the sun from the main pool on a bean bag float. FAB TIP: Mrs. Sippy’s is moderately priced. Daybeds are $1 million rupiah (About $67 USD) minimum spend, and we fit a group of three on one bed. That entire amount is applied to drinks and food, so we ended up spending about $25 USD each (we went a little over the minimum), and had plenty of food and drinks to enjoy all day (there’s a long list). Kick things off with the Sippy Frose’ (it’s on the sweet side) or the passion fruit margarita if you want something a little less sweet. The Watermelon Mule on the rocks was also a fave. For grub, feast on the nachos and other tasty small bites on the menu. 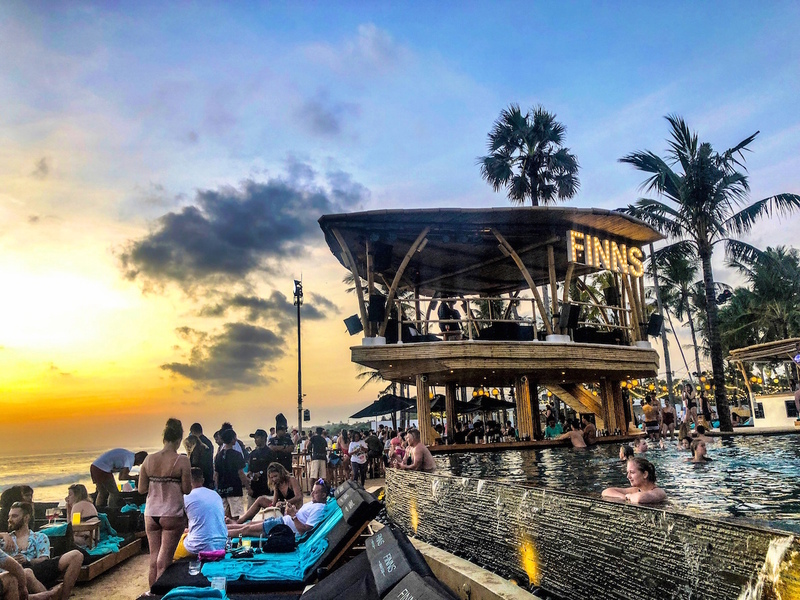 2.Finn’s Beach Club – Canggu: With it’s 1 million rupiah (about $67 USD) per single daybed minimum spend price tag, Finn’s Beach Club (which sits 10 mins away from Seminyak) was one of the most expensive beach clubs that we visited – but not one of us regretted the experience. 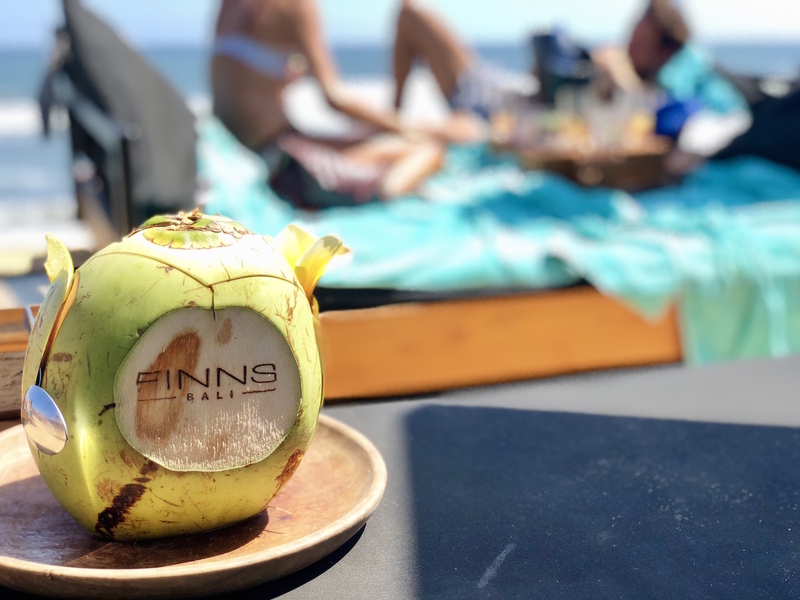 When you enter the beach club – touted as one of Seminyak’s top clubs as well – a glitzy glowing ‘Finn’s’ sign greets you, sitting atop a thatched roof swim-up pool bar. Guests lounge in the infinity pool, which overlooks the famed Berawa surf break, and has incredible views of the sunset, or right in front of it on daybeds (the best seats in the house). Others walk down to the beach, swim and kick back, before coming back up to the pool area for more fun. As for the grub, there is a full sushi menu (including rolls) and food menu. For small bites, don’t miss the chicken wings, served with a burnt chili dipping sauce or the massive plate of shareable nachos grande. For mains, it’s tough to go wrong with the Nasi Goreng (fried rice), the Finn’s Burger, or any of the pizzas. FAB TIP: You can cut the $1 million rupiah price tag in half by going to the club early and taking a chance on booking it there. The $1 million rupiah min spend guarantees that you’ll have a daybed when you reserve it ahead of time. The $500K rupiah min spend will get you a daybed if there are still some available when you arrive. If you love Finn’s, you can also spend $500K rupiah on a weekly social membership to the club. You can go as many times as you want and the price includes a free daybed with no minimum spend. We say skip the membership, go once, enjoy, and check out the other daytime experiences Seminyak has to offer. 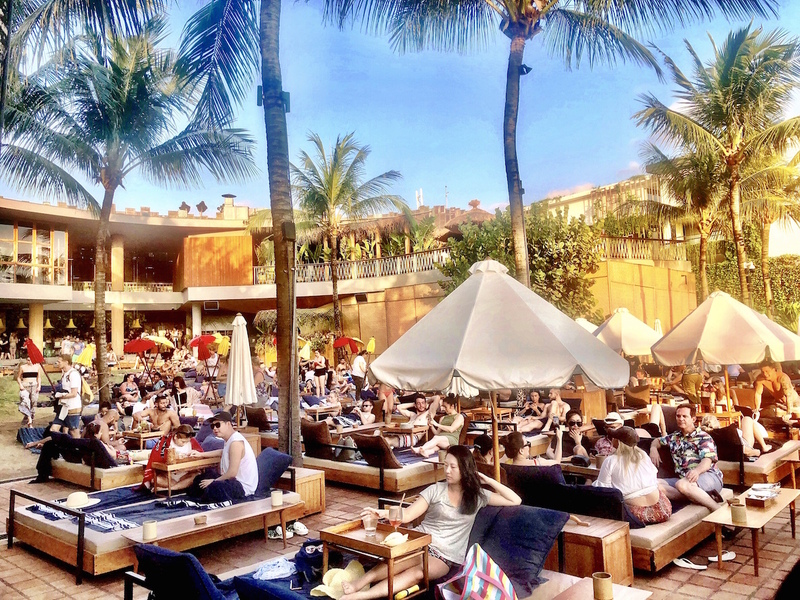 3.Potato Head Beach Club – Seminyak: Potato Head sits walking distance from the W Hotel (where we stayed) and was the first beach club we strolled in to. It kicked our trip off with a bang, and was the beach club that our driver, locals, and other Seminyak tourists told us we couldn’t miss. Everyone was right. It had a swanky feel to it, a young hip crowd (with a few tykes in the mix that parents brought along), and panoramic views of the sunset that took our breaths away. For our day at Potato Head, I sported a red strappy harness bikini from Boohoo. This is another famed hot spot beach club, known for its infiniti pool and incredible views of the sunset. It sits steps away from the beach and is home to three restaurants and three bars. The food is delish and so are the drinks. We loved the lemongrass infused Bali Pimm’s cocktail. See the menu here. FAB TIP: Call the day before or the morning you want to visit to reserve a daybed. Daybeds (we fit three people comfortably on one) are 500,000 rupiah minimum spend each (About $35 USD) and includes food and drinks. They go fast, so make sure to get there early either way for prime seating. 4. 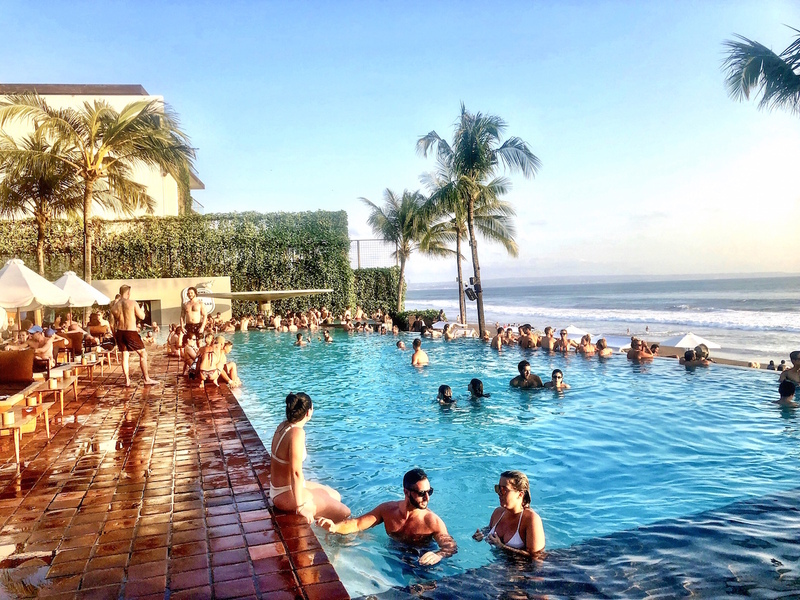 The Edge @ Oneeighty – Uluwatu: Hands down, this is one of the most beautiful – and cool – pool clubs in Seminyak. Tucked away in Uluwatu, the glass bottom infinity pool brings out visitors in droves. It is situated on the edge of a cliff overlooking the ocean and you can see right below your feet all the way to the ocean (about 500 feet down). It’s a bit of a drive from Seminyak – about 20 minutes – but so worth it. The club also has a VIP deck and rooftop lounge, sand lounge and enclosed bar, which all have panoramic views of the Indian ocean. Don’t miss the award-winning wine list here and cocktails like the Clifftop Mule and Watermelon Cooler whipped up by master mixologists. For grub, feast on lobster straight off the grill, scallop and prawn fritters, mac and cheese balls, and Nasi Goreng. FAB TIP: It’s a 600K min rupiah spend per person (About $42 USD applied to drinks and food) to hang out here. You must book this in advance – at least a week out (or a few days if you get lucky). The good news is you can do it online. Book your reservations here. 5. 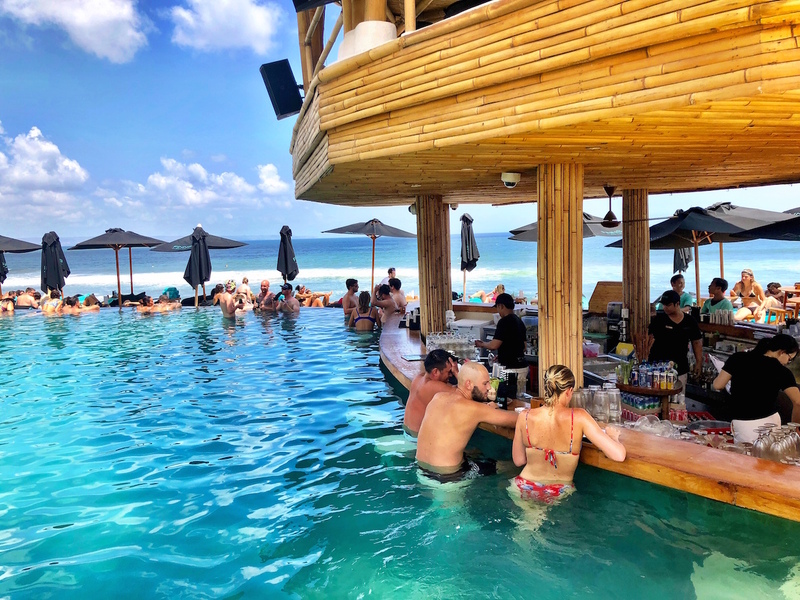 Sundays Beach Club – Uluwatu: A Beach club with a spa? Sign us up. 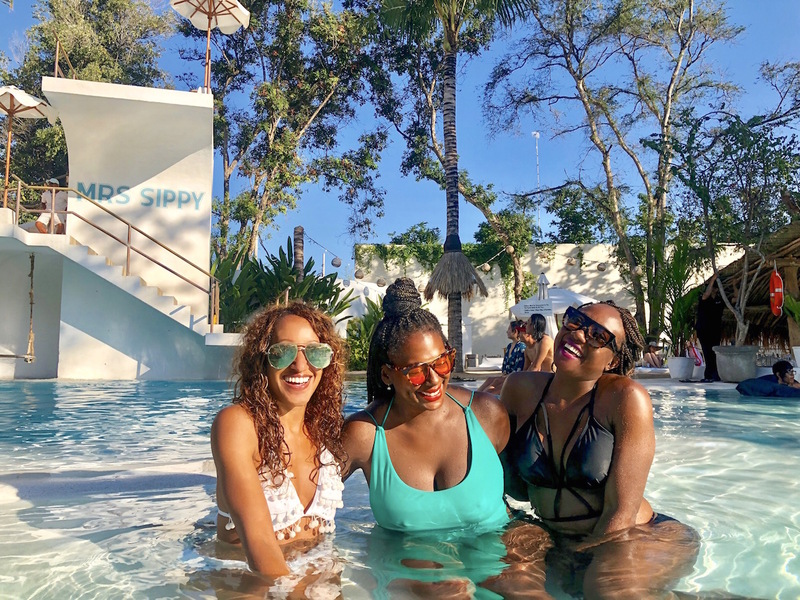 When you’re up for the ultimate day of relaxation during a girls’ trip or a trip with your significant other, head here. It’s tucked away in Uluwatu, sits above the beach with an infinity pool at the top of it, and comes complete with a cable car that takes you down to the beach. This is one of the pricier beach clubs. It costs about 450K Rupiah to enter (About $31 USD) and only about half of that (250K Rupiah) goes to food and drinks. But, those who have gone there rave about the food – like the pizzas whipped up in a wood-fire oven – and the happy hour (when cocktails are two for one). During the day, guests hang out in the pool or take a dip in the crystal clear lagoon. At night, visitors lounge on beanbags on the beach and make s’mores by a bonfire, thanks to the marshmallows and chocolate pieces provided by the staff. Ku De Ta – Seminyak: This ultra luxe beach club is geared towards the Seminyak beach clubgoer who is all about taking things to a VIP level in a sophisticated scene. If you have time, squeeze this one in and you’ll see why it landed on our list of the top places to dine in town. It has a more chill vibe than the already laid back pool/beach clubs around town tend to have and the pool is a bit small. 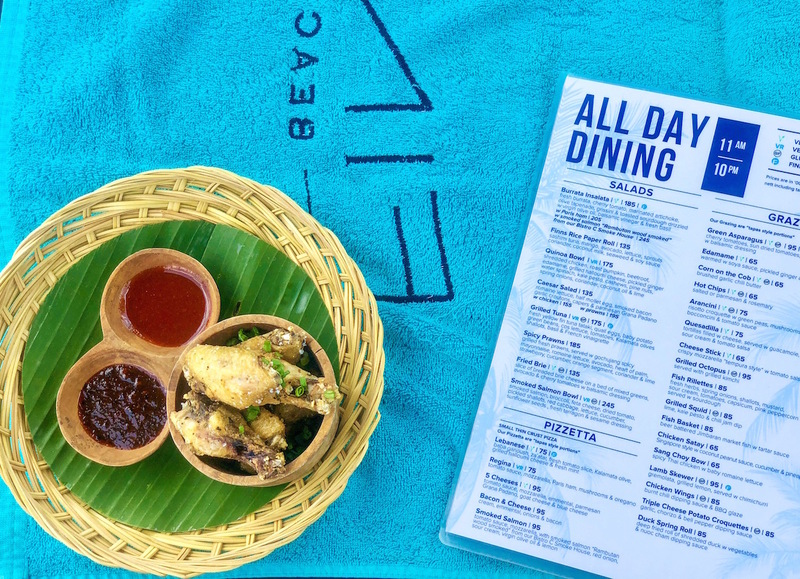 Rather than spend the day here, we say come to Ku De Ta to enjoy a few bites, cocktails and the sunset, and wrap things up. FAB TIP: Like most of the “hotspot” beach clubs in Seminyak, there is a 1 million rupiah (About $70) minimum spend to sit in the pool area. To check out Ku De Ta for a cheaper amount, sit in the dining area and order a drink. As a bonus, the dining area is close to the beach.